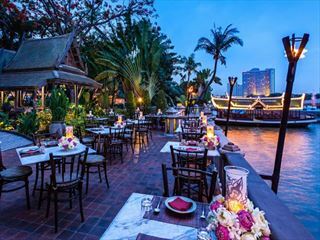 ‘The Oriental’ has been welcoming discerning travellers along the river since the 1870s when the original structure was the very first hotel to open in Thailand. 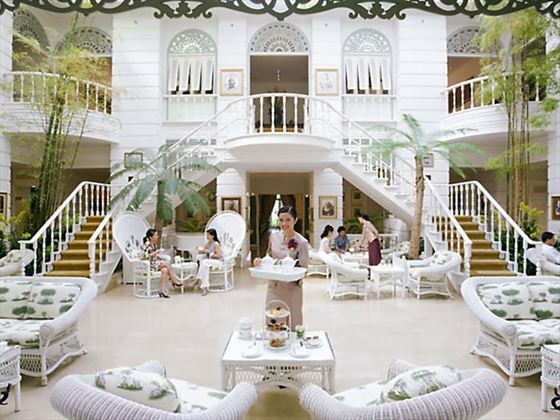 Today’s Mandarin Oriental certainly retains a heritage of old Siam with classical styling and traditional service (butler service comes as standard!) yet this is also contemporary Thai at its finest. The hotel has grown to encompass several wings and offers the modern luxury traveller the very best; it’s a gourmet destination with a world-leading spa and state of the art facilities. The only remaining 19th century building has been renovated into a selection of suites and named the Author’s wing, paying homage to the many famous literary faces that have stayed here. In keeping with the refined ambience and tradition of ‘the oriental’, a smart dress code is in place after 6pm for all guests, big and small. This is a place to indulge in the finer things in life, perfect for special occasions or that long awaited trip. 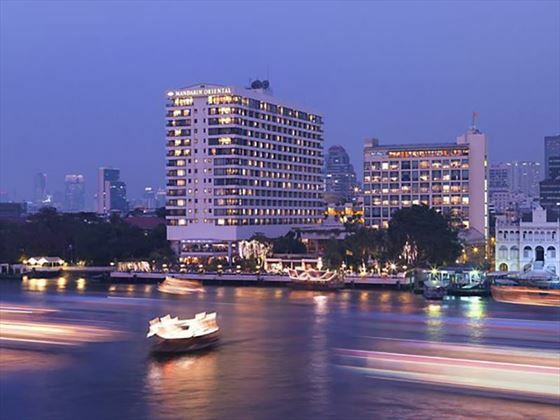 Wonderfully located on the banks of the Chao Phraya River; just a short walk from the city’s Skytrain, less than five minutes walk to the ferry landing and a short ferry ride to the Grand Palace and Wat Arun Temple. 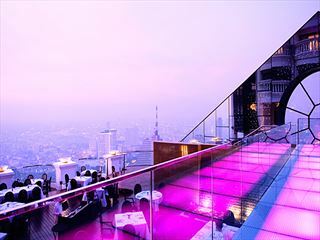 The hotel is around 45 minutes from Bangkok international airport by car transfer. Superior Rooms – are in the main wing, sleeping 2 adults with King or Twin bed options. 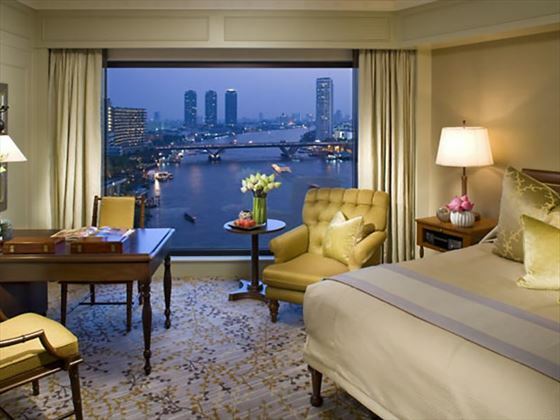 Deluxe Rooms –are found on the higher floors with river and city skyline views. Garden Rooms – are in the Garden wing with partial river views, adjacent to the garden suite. Extra touches in these rooms include a cocktail cabinet, full size fridge, Molten Brown toiletries, portable Bluetooth speaker, complimentary digital movie library and floor to ceiling windows. Mandarin Rooms – very spacious rooms in the main wing with a balcony and walk-in closet. Suites – each and every suite is individually designed with one or two bedrooms sleeping up to 5 with spacious living areas and views of the river from the main wing or overlooking the garden and the river from the garden wing. 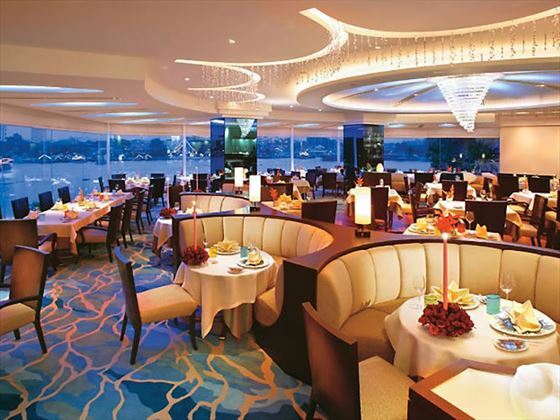 A total of nine restaurants to choose from with both Asian and European fine dining; all have an evening dress code. A Thai cooking school is also available to learn some of the chef’s secrets. 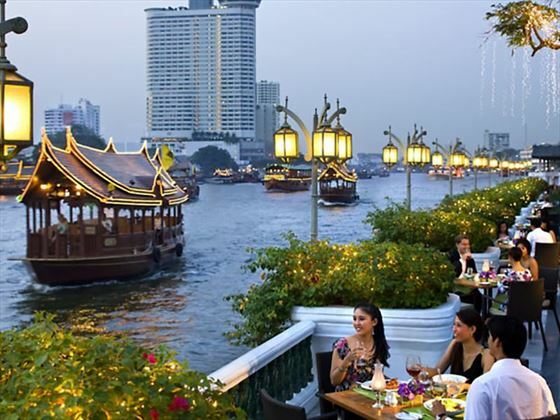 Lord Jim’s - seafood is served with a view over the river at this legendary restaurant, known for its lunch buffet including superb sushi. (A la carte and set menus in the evening). Sala Rim Naam- is located opposite the hotel with Traditional Thai cuisine and an evening Thia dance show. There is also al fresco dining here if preferred. The China House - Contemporary Chinese in a beautiful Art Deco building. 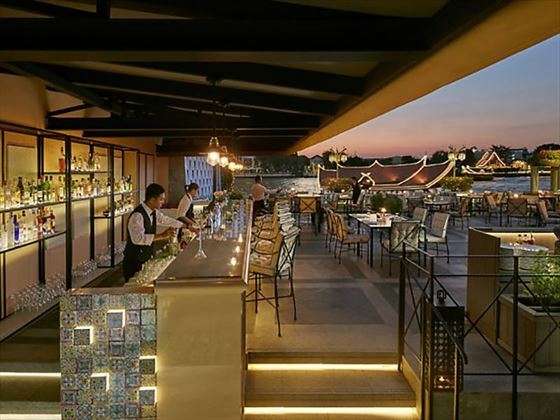 The Verandah - All day dining with indoor and outdoor seating – all with views. French cuisine and Italian specialities are available at Le Normandie & Ciao Terrazza. 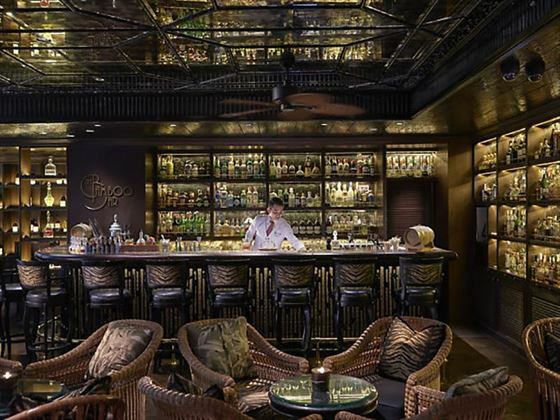 Bamboo Bar - live Jazz and cocktails can be found at this elegant bar, where expert mixologists have been serving up inventive cocktails since the 1950s. 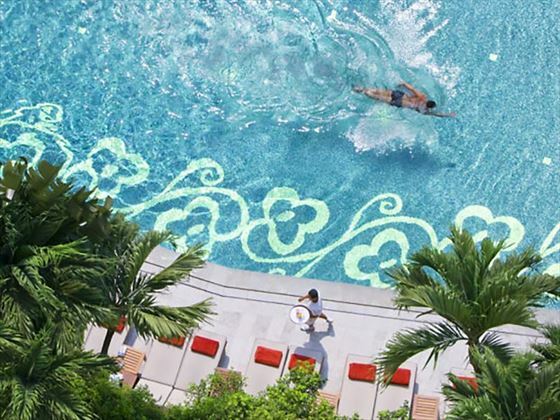 Two outdoor pools are set in landscaped gardens; one predominantly for lazing around and dipping in for a cool off and the other a 25m lap pool for swimmers to enjoy. Children aged 3-14 years are welcome to try out the Kids Club and its range of supervised activities including arts and crafts and cultural activities. The club is open daily from 3pm and stays open late so you could enjoy a ‘date night’ dinner in one of the hotel’s eateries. For babies the hotel has equipment including cots, sterilisers, bathtubs and bath amenities. 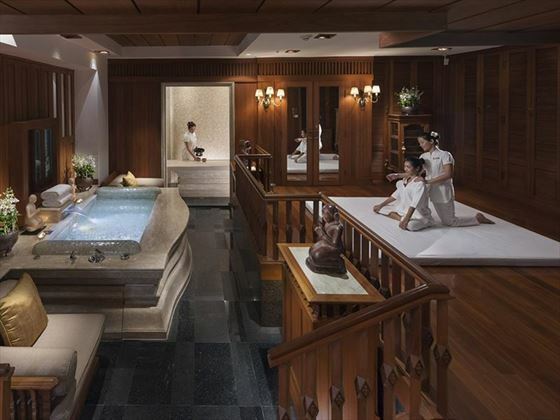 One of the premier spas in Asia, housed has its own 100 year old teakwood building; guests are transported by a short boat trip. Thai treatments, both traditional and cutting edge are on the menu plus Ayurveda is a specialism here. Next door to the spa is a state-of-the art fitness centre. Complimentary fitness classes are available such as Muay Thai boxing, circuit training and Yoga. If you prefer to exercise outdoors you can make use of the outdoor tennis court and the jogging track. 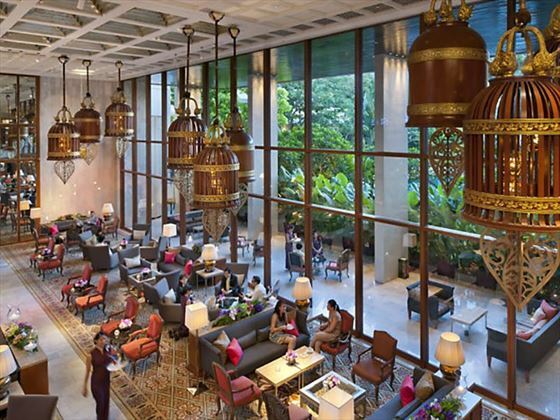 If you are looking for a more tranquil and relaxing stay in Bangkok, away from the hustle and bustle of city life, The Siam Bangkok is the place for you. 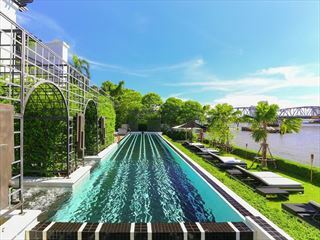 Set on 3 acres of serene gardens on the Chao Phraya River, it is a wonderful and surprising sanctuary. You will enjoy the aspects of city life by day and a tranquil haven by night in this colonial-era, art-deco themed, intimate resort. 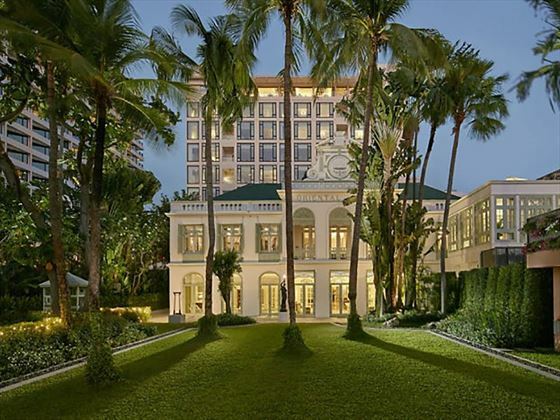 To stay in the Peninsula is to choose an iconic landmark; perfect for any special occasion or ‘just because’, your time at the Peninsula will be a highlight of your Bangkok visit.